Copy mode ( ): The distributed copies are separate objects that are independent of each other. Attributes of one object can be changed independent of other objects. This mode is especially useful for creating objects to manipulate with the the Tweak Tool. Clone mode ( ): The distributed copies are clones of the original object. Changing the attributes of the original object changes the attributes of all copies. 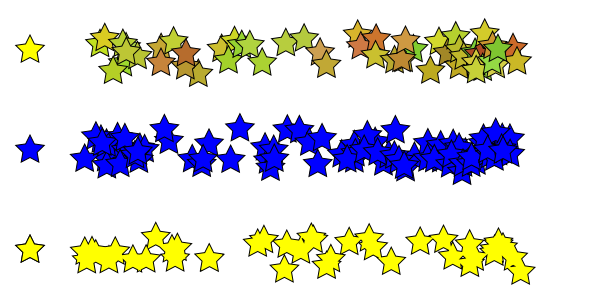 The Fill color of the original object was changed from yellow to blue after spraying the stars. This mode is moderately less demanding on renderers than the Copy mode. Single Path mode ( ): The distributed copies are part of the same Path. Overlaps of objects are removed. This mode is more CPU intensive during spraying. The source object may need to be converted to a path first. Examples of the three spray modes. From top to bottom: Copy mode: The style of each copy can be changed individually as was done here using the Color Jitter mode of the Tweak Tool. Clone mode: All clones must have the same style. If the original object is changed, all the clones are changed in the same way. Path mode: The copies are merged into one path with overlaps removed. To use the Spray Tool first select one or more objects you which to spray with the Select Tool or any other selection method. Then select the Spray Tool from the Tool Box ( ) or use either of the shortcuts: A or Shift+F3. Hold the Left Mouse Button down while moving the mouse or the mouse scroll wheel. Once the Spray Tool has been selected, you can toggle between the Spray Tool and the Select Tool using the Space Bar. Width: Determines the area of the spray (indicated by the orange circle when the Spray Tool is selected). The range is from 1 to 100, where 20 corresponds to a radius of 100 screen pixels. As the spray width is defined in screen pixels, zoom can be used to quickly change the size of the spray relative to the size of the drawing. The Left Arrow and Right Arrow keys can be used to decrease and increase the width at anytime. Home sets the Width to 1, while End sets it to 100. Amount: Determines how the relative number objects sprayed. The range is from 1 to 100. If the “Use Pressure” button ( ) is toggled on, a pressure-sensitive tablet can be used to control the rate objects are sprayed; maximum pressure corresponds to the Amount parameter setting. See the Calligraphy Tool section for use of a tablet. The Up Arrow and Down Arrow keys can be used to decrease and increase the (maximum) Amount. Rotation: Adds a random rotation to each copy if non-zero. The setting determines the maximum rotation amount. The range is from 1 to 100 where 100 corresponds to plus or minus 180°. Scale: Adds a random scale to each copy if non-zero. The setting determines the maximum scaling amount. The range is from 0 to 100 where 100 corresponds to twice the original size. Scatter: Determines how the items are scattered. The range is from 1 to 100 where 1 corresponds to all the objects being sprayed under the cursor and 100 corresponds an even distribution over the spray region. Focus: Determines the spread of the scattered items. The range is 0 to 100 where 0 corresponds to all the items being sprayed under the cursor while 100 corresponds to items being sprayed at the edge of the spray area. Examples of several of the spray parameters. From top to bottom: Scale: Parameter set to 0 on left, 100 on right. Scatter: Parameter set to 1 on left, 100 on right. 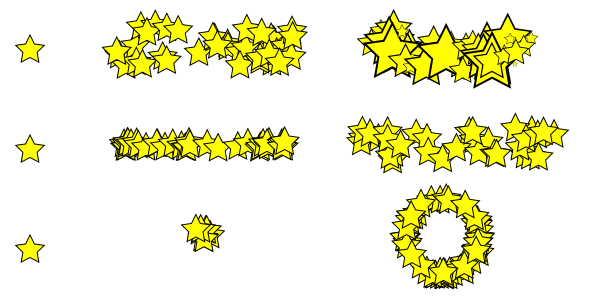 Focus: Parameter set to 0 on left, 100 on right (Scatter set to 5, cursor jiggled in place).